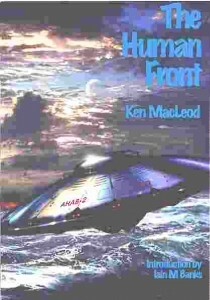 As well as his many novels MacLeod has also written a novella - “The Human Front”, available in the “Infinities” anthology. It takes place in Scotland (unsurprisingly) in an alternate universe, where the Americans and British started World War 3 against the Soviets shortly after the end of World War 2. The main character is John Matheson, who as a young boy witnessed some strange events when one of the American's secret anti-gravity flying saucer-shaped bombers calls in for medical assistance at a remote air base. John's father is called upon to treat the pilot – who seems to John to be merely child-sized, although he doesn't get a close look. Years later, John and his family have moved to Glasgow, where John, now a naive, idealistic teenager, becomes increasingly involved in a pro-Soviet militia, despite his father's despair at John's gullibility where the Soviet propaganda is concerned. As events progress John eventually gets a second opportunity to get a look at one of the flying saucers – this time in rather different circumstances. The background is typical MacLeod, with the result that the early stages might now feels a bit over-familiar to anyone who has read his novels already. Also, this doesn't really have the depth of his novels, and although there are some interesting ideas, they aren't really developed very much – in particular, the climatic revelation is merely given a handful of pages of hurried exposition, whereas it had the potential to be the premise for a decent-sized novel. It is well-written, the characterisation is good and is quite entertaining, but the ending feels far too rushed and it might have worked better as a novel rather than a short story. In summary, a reasonable short story that doesn't really live up to the potential of its premise.